Well, despite that, I’m still absolutely in Love with Instagram and today’s topic is not complaining about it but telling you about all the amazing additional things that come with it! 11 things to make Instagram even cooler! The Instamap iPad app ($2) is a slick new Instagram client for the iPad that allows you to browse photos by location or tag. View geotagged images from around the world as pins on a map, or switch to the attractive gallery view. Instamap also makes it easy to add or delete Instagram subscriptions, like photos, and leave comments. And it’s updated in real time, so there’s no waiting around for fresh pics. Instagram has a much-beloved set of 15 retro photo filters that you can apply to an image. For iPhone photographers who want more options, the 100 Cameras in 1 app ($1) has 100 poetically named effects that you can mix and match. The app has also just added Instagram support with its latest update, so you can take a photo, edit it in 100 Cameras in 1, and then export it directly to Instagram. Instagram automatically saves each photograph as a 612-by-612-pixel, 72 ppi file. This is pretty small, even by iPhone photography standards (the iPhone 4 can capture 2592-by-1936-pixel images). To make a print of an Instagram shot, you should start by increasing the ppi in an image editor. At the recommended 240 ppi, you’ll get a sharp 2.5-by-2.5-inch print. If you really want it larger, you can blow the image up to 4-by-4-inches, but that will lower the dpi to 153 ppi. The print will be larger, but it will also appear slightly softer and pixelated. Refreshing for being one of the only Instagram-related products to resist the “Insta-” or “-gram” wordplay, Carousel($5) is a stunning and minimalist way to view Instagram photos on your Mac desktop. Choose from one of the four themes and enjoy the small, vertically scrolling window of Instagram images from the photogs you follow, popular images, or your own feed. The program supports a variety of keyboard shortcuts, including Spacebar for Quick Look, L to like a photo, and C to comment on it. 5. See you stats etc. The Statigram Website generates a satisfying breakdown your Instagram statistics. Log in to Statigr.am (free) with your Instagram user name and password, then start quantifying. See your most popular images and filters, find out what day of the week you post on the most, view your tags at a glance, and take a peek at your Instagram followers. You can even have your stats e-mailed directly to you if you feel like sharing them on Instagram (meta) or just reveling in your own popularity. 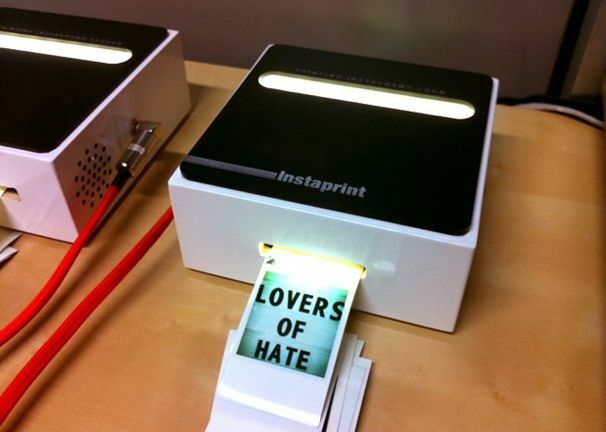 The folks at Instaprint bring the online social experience of Instagram into the real world. When you hire Instaprint (check their availability by e-mailing instaprint@breakfastny.com), they set up an Instaprint box at your party. Party-goers snap Instagram photos at the event and use a custom hashtag, and the box looks for Instagram images with the right hashtag and location information. It then prints out the images on Zink paper, with the photographer’s icon and name on top of the image and any comments below. Enjoy browsing Instagram photos on a device with more screen real estate: your Mac. The $2 InstaDesk Mac app is a fetching way to look through your Instagram feeds on a desktop. View images by popularity and tags, see everyone who follows you, or find new people to add to your Instagram circle. All the usual Instagram interactivity is here, including the ability to leave and receive comments. You can even save your favorite images to your computer. Unfortunately, you can not upload images to Instragram from your Mac. Have you ever noticed how adorable your Instagram photos look in thumbnail view? Printstagram will turn your Instagram photos into a book of 252 little stickers ($10). If tiny doesn’t do it for you, go big with a 20-by40-inch poster of your tiled Instagram images ($25). If you’d prefer to print your own fun projects, check out the free templates from Printsgram. It will automatically layout your Instagram photos in the templates and let you download the PDF. You’re on vacation, the scenery is amazing, and you want to send a postcard to your technophobe grandfather. The Postagram iOS app will turn your Instagram image into a real postcard, add your custom message, and send it in the snail mail to whatever address you enter. The app is free but each postcard costs $1. You’re not limited to sending Instagram images—you can choose any shot from your Photo Album. Given Instagram’s exploding popularity, it’s only natural for some of its online socializing to spill over into in-person meet-ups. The Instagram group on Meetup.com currently has 2,394 members in 512 cities. If you’d enjoy making some like-minded friends, find or start an Instagram meet-up near you. The gatherings range from casual coffee klatches for swapping photo tips, to full-on scavenger hunts, where participants have to take Instagram photos of all the items they find. Instaport is a simple way to export all your Instagram photos to other social services or your local hard drive.